I fell in love with the Wallace & Gromit animated features as soon as I watched The Wrong Trousers - I just have a thing for penguins, I guess. Plus Gromit is downright adorable despite not having a single line of dialog in any of their little adventures - and he just works out that way. With Telltale Games exploring different franchises like Sam & Max, The Walking Dead and even Back to the Future, it's a great thing indeed that they decided to set their sights in creating graphical adventure games for Wallace & Gromit. And thus we've received the episodic adventures that start with Fright of the Bumblebees, the first of four separate adventures featuring the two lovable characters. Wallace & Gromit Episode 1: Fright of the Bumblebees is the first of 4 episodic graphical adventures developed by Telltale Games for the Wallace & Gromit franchise. The stories were created by the Aardman Animations team while Telltale Games did the legwork. This time around, we discover that bunging inventor Wallace has started a new business called "From Bee to You" - a home delivery service for honey. He takes on an order for 50 gallons of honey in order to make-up the damage done by his mouse-catching robot that honed in on cheese. Given it had been tasked to guard a grocery that had a wide variety of cheeses meant the results were less than ideal. But even with the greater efficiency of pollinator machine that optimally converts flowers into pollen that the bees can use, Wallace realizes that he needs a lot more flowers than are readily available. And waiting for flowers to grow the normal way is far too slow in order to meet the honey order in time. And you know this will lead to Wallace coming up with a crazy solution to all of their problems. The game alternately places you in control of either Wallace or Gromit, depending on what the story requires. You can't switch characters at will - so you're stuck with one until you reach the next section of the story. In terms of functions the two are practically interchangeable since they don't have specialized abilities, unless you count Wallace's ability to talk as a special ability. Each character has his own inventory and there's no way to switch items between characters. So you just work with what you have. The animation style of the game was interesting since it tired to balance keeping the simple shapes of the original clay animation cartoons and what computers can come up. The characters have some interesting textures that includes the odd blemish and dimple that appears to me like an effort to recreate the look of molded clay. Animation also follows the distinct eyes and mouth shapes that have sort of defined all of Aardman's creations. The game is pretty much a point and click adventure with few frills added. There's the odd mini-game that requires a bit more skill than wits, but on the whole it follows the core principles. You interact with characters and pick up items of interest. You figure out which item might be used and all that good stuff. When compared to other adventure games, this one was certainly simplified to some extent. There are no dialog trees to navigate and pretty much the entire map is open to exploration from the very start of the game. You also can't combine inventory items with one another, so it's really more about figuring out where each item might be useful. A little targeting box appears around items of interest, although the odd camera angle or two. Multiple selection areas that sort of overlap in the 3D environment . It makes for the odd moments of frustration as you try to select a doorknob to get to the next room but instead select other objects that happen to be near the door. And the effective operation of doorknobs is the only way to get in and out of a room, for the most part. Game mechanics aside, the game is quite a delight and the story features the same oddball humor that we've come to enjoy and love as seen in their other animated adventures. Game length is pretty decent - it didn't feel too short or too long. There was the odd sequence or two that felt a little rushed (like the one involving the queen bee), but otherwise it's a lot of good fun. 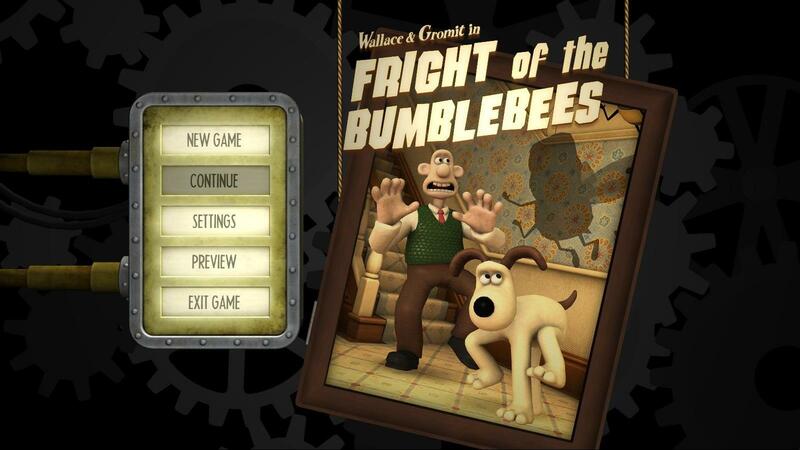 Wallace & Gromit: Fright of the Bumblebees is a great translation of the quirky fun of the Wallace & Gromit features into an interactive game. I enjoyed the experience a lot and I look forward to playing the rest of the episodes in this limited franchise. The game itself gets 4 terrorizing bumblebees out of a possible 5.